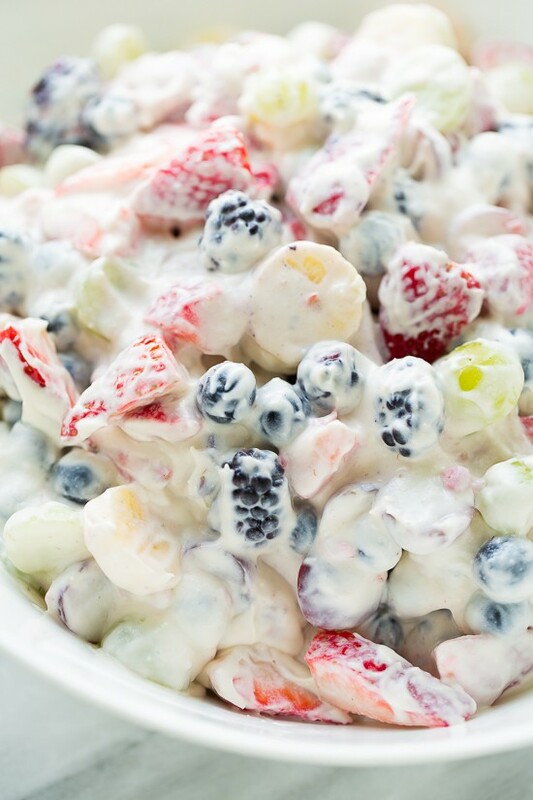 Healthy Cheesecake Fruit Salad! Perfect for parties and potlucks. Dairy-free and honey-sweetened! A few weeks ago the boys and I met up with my husband for lunch. We had been wanting to try out a taco food truck that makes everything totally gluten-free. The tacos were delicious and it was great to eat out and not worry about cross-contamination! For dessert, the food truck had the most amazing fruit cups. They used all kinds of berries, grapes and bananas covered in sweet vanilla whipped cream. My 14-month-old, Graham, is already a berry-obsessed baby – but with the addition of whipped cream he went a little crazy begging for every last bite! I knew I wanted to recreate it to make for parties and BBQs this summer. 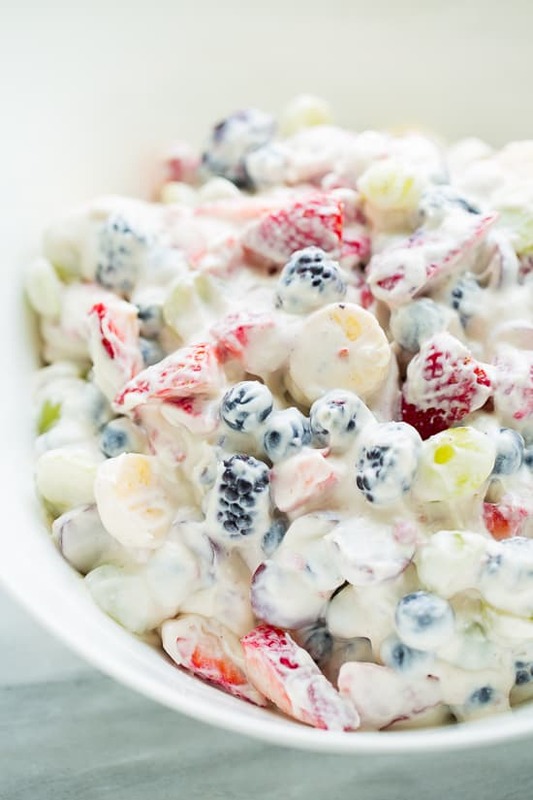 I make this berry salad with coconut cream, dairy-free cream cheese (I like Kite Hill) and honey to keep it dairy/refined-sugar free. 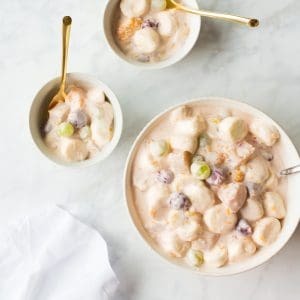 It tastes like cheesecake fruit salad! Desserts with berries remind me of Memorial Day and the 4th of July. This is a great dish to bring if you want to contribute a healthy treat to a potluck. You can also use regular cream cheese if you can eat dairy. 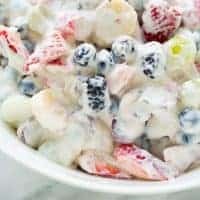 This fruit salad works great will all kinds of fruit, so you can switch it up depending on what you have! 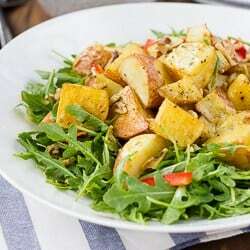 This is a great dish to bring to a party! I keep the “fluff” part separate and stir it together just before serving. I also like to add the bananas just before serving. This feeds a lot of people so feel free to half it for smaller crowds. You can either use a can of coconut cream (like from Trader Joe’s) or you can chill 2 cans of full-fat coconut milk for a few hours and scrape the solid part off the top for the coconut cream. Place all the fruit, except the bananas in a bowl. In another bowl, place the coconut cream, cream cheese, honey and vanilla. Using an electric mixer, beat on low then increase the speed to high. Beat until light and fluffy, about 3 minutes. Keep the fruit and fluff separate until just before serving. Fold the fluff into the fruit. Add the bananas and gently stir to combine. Enjoy! This looks easy AND lovely! Such a great alternative to using Cool Whip. I love it! This sounds so good!! Love that you made it dairy free. I have yet to try Kite Hill, but so many people rave about it. I’ve got to get my hands on some!! Thank you! Kite Hill Cheese is so good. You’ll love it! WOW! Need to try this ASAP! This looks so creamy and beautiful!! YUM! Perfect summer treat. I need to figure out where to get Kite Hill by me! Thanks Lauren! Kite Hill is so good! You had me at cheesecake! 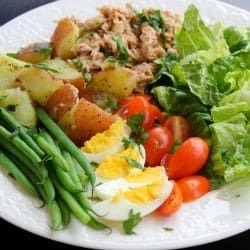 Oh what a beautiful and delicious looking salad! This would be perfect for the upcoming labor day weekend!